Scléip agus Siansa … ardán don óige le Gael Linn! 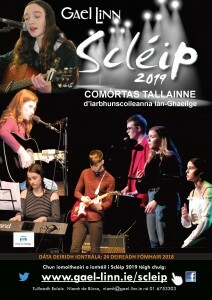 Tá deis iontach á thabhairt do dhéagóirí a gcuid dtalainne a léiriú ar ardán trí chomórtais Gael Linn, Scléip (comórtais ceoil agus rince comhaimseartha) agus Siansa (comórtas do ghrúpaí ceoil traidisiúnta). Is éard atá i Scléip ná comórtas tallainne spreagúil agus spraíúil atá dírithe go sonrach ar na hiar-bhunscoileanna lán-Ghaeilge. Cuireann sé béim ar na healaíona comhaimseartha agus ar chruthaitheacht agus ar chumadóireacht na rannpháirtithe. 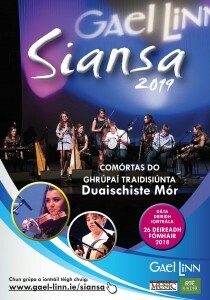 Tugann sé deis do dhaltaí iar-bhunscoile ceol, amhráin agus rince a chur ar stáitse os comhair lucht féachana agus moltóirí proifisiúnta, in amharclanna ó cheann ceann na tíre. Tá Scléip á mhaoiniú ag Foras na Gaeilge. 2. Amhránaíocht Aonair Chomhaimseartha, le tionlacan ó Fhuaimrian Taca (Sóisear agus Sinsear) NUA ! Chun iomaitheoirí a iontráil i Scléip 2019 téigh chuig www.gael-linn.ie/scleip (Spriocdáta iontrála – 24 Deireadh Fómhair 2018). Is comórtas do ghrúpaí traidisiúnta é Siansa atá á reáchtáil ag Gael Linn, le tacaíocht ó RTÉ Raidió na Gaeltachta agus Irish Music Magazine, chun spreagadh agus ardán a thabhairt don chuid is fearr de ógthallann cheoil agus amhránaíochta traidisiúnta na tíre, trí mheán na Gaeilge. • Bíonn fáilte roimh iontrálacha ó scoileanna, ó eagrais/clubanna ceoil, nó fiú is féidir le cairde teachtle chéile mar ghrúpa. Níl aon teorann leis an líon grúpaí a cheadófar do scoil/chlub nó eile a iontráil. • Caithfidh idir 6 agus 8 ball a bheith i ngach grúpa. • Beidh táille iontrála €20/£20 le híoc ag gach grúpa. 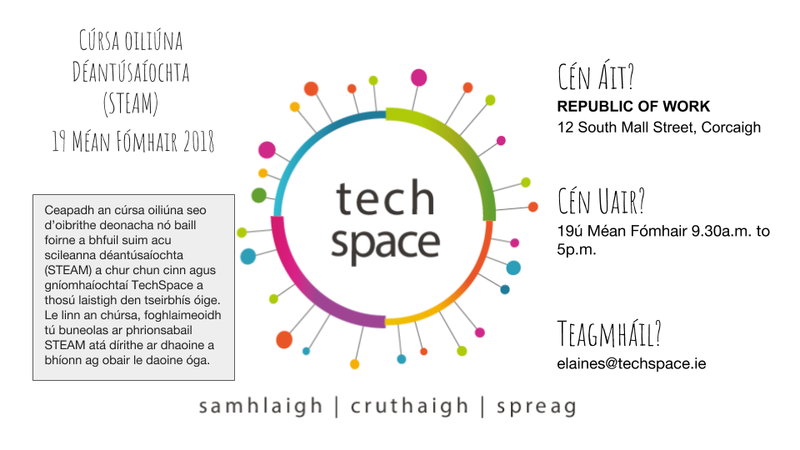 • Iarrtar ar ghrúpaí clár nó teaglaim leanúnach de cheol traidisiúnta idir 10 agus 12 nóiméad ar fhad, le hamhrán amháin i nGaeilge mar chuid de, a chóiriú go samhailteach agus a thaifead. 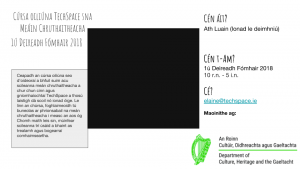 Is gá na taifeadtaí a bheith ag Gael Linn roimh 4 Nollaig 2018. • Éisteoidh léirmheastóir le gach taifead agus roghnófar grúpaí de réir a gcaighdeáin chun páirt a ghlacadh i gceardlanna aon lae. Ceoltóirí /amhránaithe aitheanta a bheidh i mbun na gceardlann agus cuirfidh siad comhairle ar na grúpaí faoi ghnéithe éagsúla dá léirithe. Reáchtálfar na ceardlanna idir Dé hAoine, 8 agus Dé Luain 11 Feabhra 2019 i gceithre ionad éagsúla ar fud na tíre. 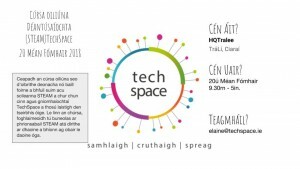 • As na ceardlanna seo, roghnófar 8 ngrúpa chun páirt a ghlacadh sa Chraobh ar anDomhnach, 7 Aibreán 2019 sa Cheoláras Náisiúnta i mBaile Átha Cliath. • Bronnfar príomhdhuais €2,500 agus Trófaí Gael Linn ar na buaiteoirí. Bronnfar €1,250 orthu siúd a thagann sa dara háit agus €750 don triú háit. Deirtear uaireanta go bhfuil sé deacair daoine óga a spreagadh chun na léitheoireachta, trí mheán na Gaeilge go háirithe. Ceannaigh an iris seo agus feicfidh tú nach bhfuil aon fhírinne sa ráiteas sin. Taitneoidh an iris Breacadh le daoine óga (idir bhuachaillí agus chailíní) mar tá sé barclíonta ó chlúdach go clúdach leis na scéalta is deireanaí. Cé go bhfuil an iris seo dírithe go príomha ar fhoghlaimeoirí fásta litearthachta sa Ghaeltacht, díoltar líon mór cóipeanna le scoileanna – ag an mbunleibhéal agus an dara leibhéal – ar fud na tíre. Bí leo! Ar mhaith le do scoil bheith rabbpháirteach i staidéar maidir le cumas litearthachta a thuar i bpáistí óga? Cad í aidhm an staidéir seo? Is í aidhm an staidéir seo ná an nasc idir scileanna áirithe – an fheasacht fóineolaíochta, an chuimhne fheidhmiúil agus luas próiseála – agus an litearthacht a fhiosrú sa Ghaeilge. ​What is the aim of the study? The aim of this study is to investigate how certain skills – phonological awareness, speed of processing and working memory – contribute to literacy ability in Irish and English. Céard atá i gceist leis an staidéar? Iarrfar ar scoláirí sna Naíonáin Bheaga, sna Naíonáin Mhóra agus i Rang a hAon a bheith páirteach sa staidéar. ​Iarrfar ar na rannpháirtithe tascanna simplí a dhéanamh sa Ghaeilge agus sa Bhéarla. uair amhain idir Mí Éanáir agus Mí an Mheithimh 2020. Pupils in Junior Infants, Senior Infants and First Class will be invited to participate. ​Each participant will complete simple tasks in Irish and in English. on one occasion between January and June 2019.
on one occasion between January and June 2020. Gach eolas agus foirm iarratais anseo! Anseo thíos ta teideal na gcainteanna a spreagfaidh an plé. 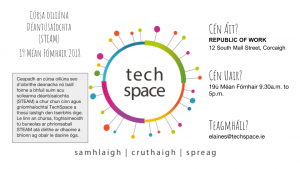 Breathnóidh an ócáid eisiach saor in aisce seo, a bheidh ar siúl in ionad One Microsoft Place ar na dúshláin agus na réitigh chun oideachas éifeachtach trí mheán na Gaeilge a sholáthair in Iarbhunscoileanna lán-Ghaeilge san aois dhigiteach seo. 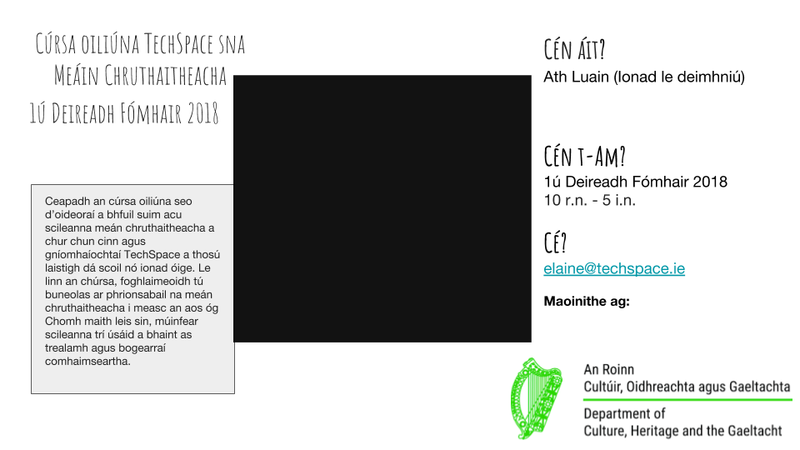 Taispeánfaidh múinteoirí atá ag obair in Iarbhunscoileanna lán-Ghaeilge an bealach is fearr leis an dea-chleachtais a chur i ngníomh agus a bhainistiú go héifeachtach sna scoileanna chun barr feabhas a chur i bhfeidhm ar an teagasc agus ar an bhfoghlaim. 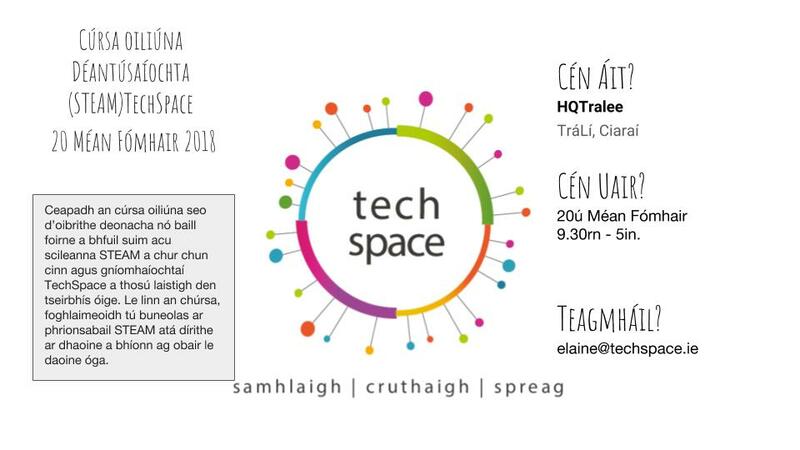 Tá cúrsaí an-suimiúil á reáchtáil ag TechSpace trí Ghaeilge do mhúinteoirí agus d’oibrithe deonacha.